1979 – Now: Satellite data (UAH, as per Figure 14). 1850 – 1979: Land thermometer record (HadCrut3, from the UK Met Office Hadley Centre and the Climatic Research Unit, slightly less tricked up than the GISS data of Figure 13). 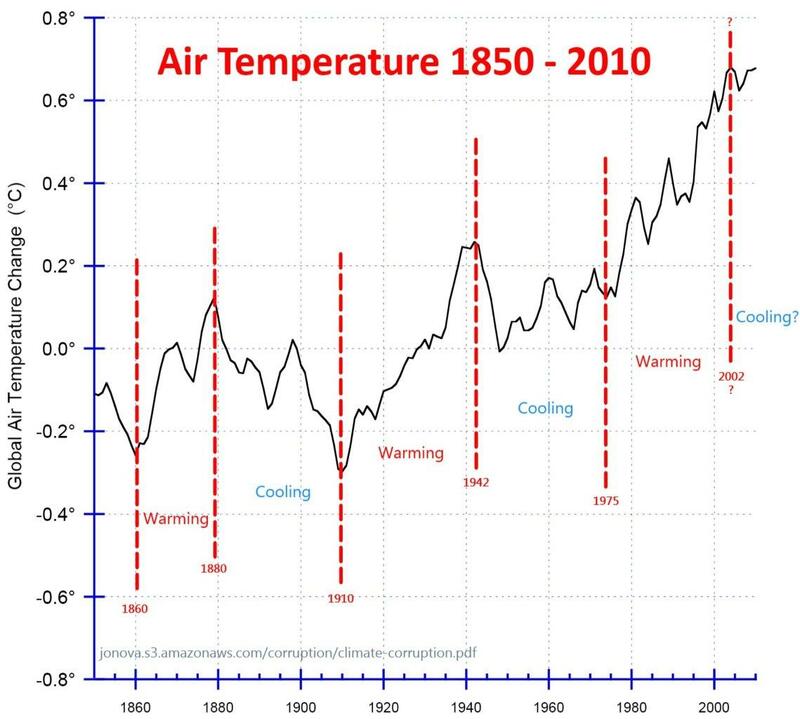 The land thermometer records exaggerate the rate of warming using the tricks documented in parts 1 and 2 of this series, but they are the best data we have for 1850 – 1979. However we need a rough idea of historical temperatures in that period to make several crucial points, so we will go with that data. Figure 17: The best and latest temperature picture. 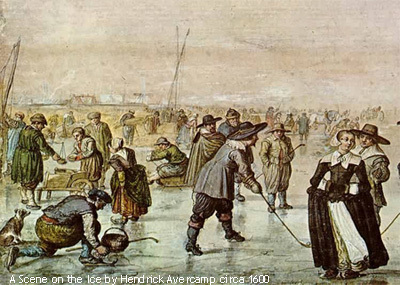 The current global warming trend started around 1670 to 1700, some 310 years ago. The current temperature is probably less than the medieval peak—the land thermometer data from 1850 to 1980 exaggerates temperature increases, though no one knows by how much. Sources: See text above. 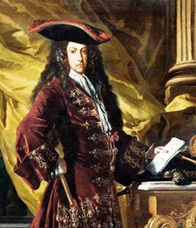 The current global warming trend started before 1700, some 310 years ago. 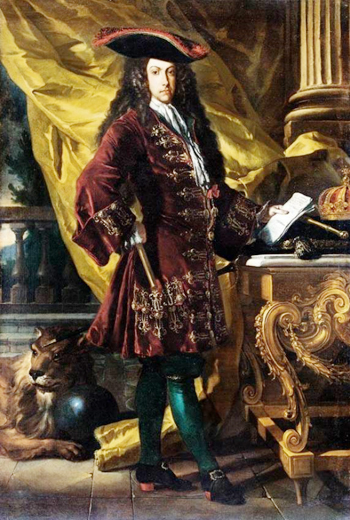 That was pre-industrial, so a natural climate force must have started the current global warming trend. 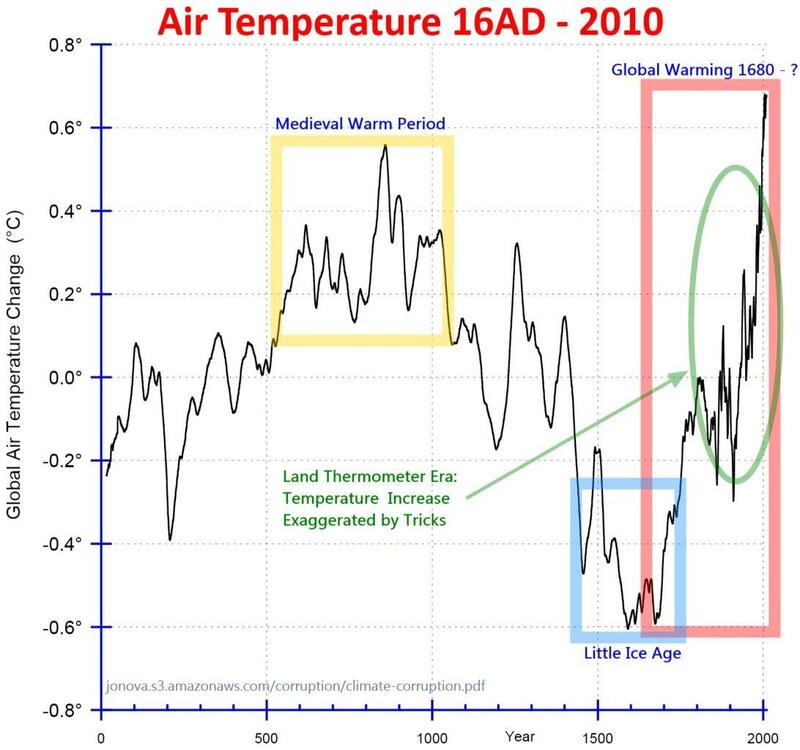 That the medieval warm period existed is well documented in European history. That it was worldwide is verified by hundreds of peer-reviewed studies, by over 700 scientists from over 400 separate research institutions, most of whom found that the period was probably warmer than today. The studies are from all over the world (except Australia)—here is a stunning illustration that makes that point. 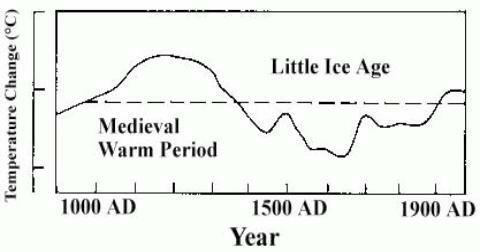 Likewise the little ice age is well documented in European history. 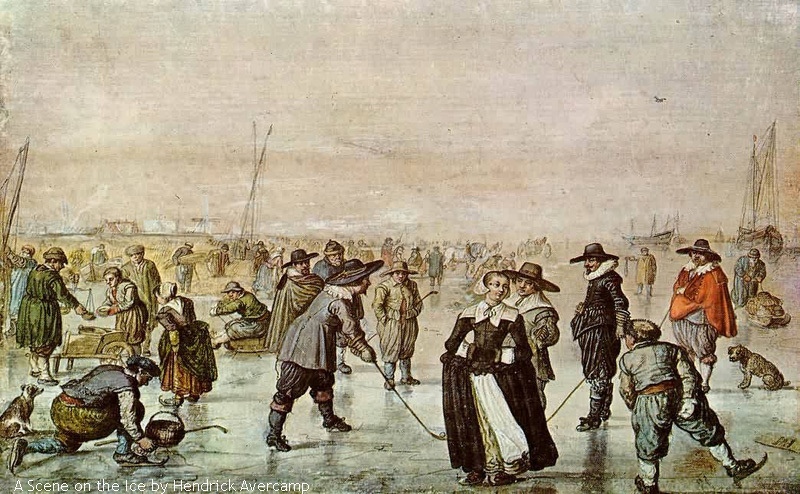 It forced an end to the Viking colonization of Greenland in about 1430, the Thames River in London froze over most winters but the last time it froze was 1804, and in the 1600s and 1700s animals in Europe would die of cold inside barns which never happens now. 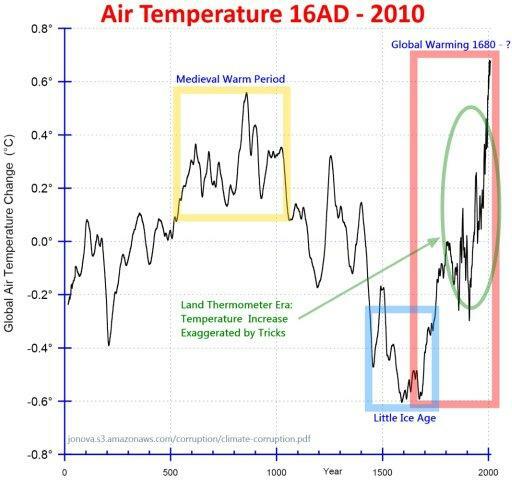 Like the medieval warm period, temperature proxies around the world confirm that it was worldwide. Figure 18: The climate establishment’s temperature picture in 1990, with the current global warming trend starting around 1650. From the First Assessment Report of the IPCC, page 202. Figure 19: The climate establishment’s temperature picture in 1995, with the current global warming trend starting around 1680. From the Second Assessment Report of the IPCC, 1996, via here. Figure 20: Alternating periods of warming and cooling, within the overall warming trend. The periods last about 20 – 33 years each. Warning: This is land thermometer data, which has been subjected to tricks and revisions (especially 1940 – 1975)—the turning points shown are the generally agreed ones, except that 2002 is still ambiguous because it is not yet confirmed by a definite subsequent decline (see Figure 14 in Part 2 ). Source: Figure 17. If the pattern continues, the next 12 – 35 years will see cooling. How many in the public or the political class are aware of this pattern? Everyone has heard the climate establishment’s forecast that the strong warming of the last three decades will continue while we continue emitting CO2. 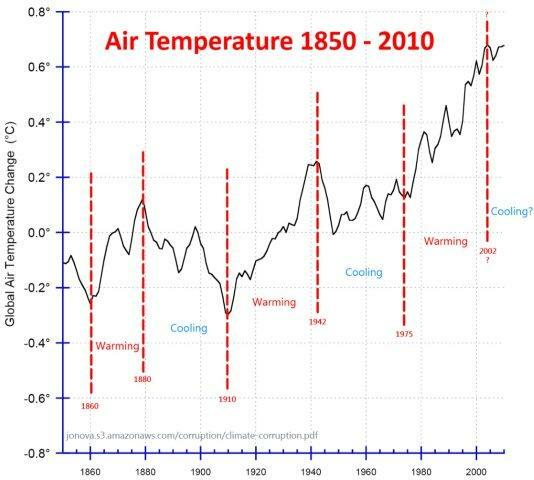 But the establishment do not tell people that some or all of that strong warming since 1975 is due to a cyclic phenomenon that is now entering a cooling phase.